The goal of this paper is to introduce local length scale control in an explicit level set method for topology optimization. The level set function is parametrized explicitly by filtering a set of nodal optimization variables. The extended finite element method (XFEM) is used to represent the non-conforming material interface on a fixed mesh of the design domain. In this framework, a minimum length scale is imposed by adopting geometric constraints that have been recently proposed for density-based topology optimization with projections filters. Besides providing local length scale control, the advantages of the modified constraints are twofold. 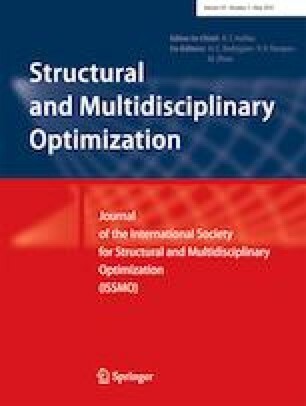 First, the constraints provide a computationally inexpensive solution for the instabilities which often appear in level set XFEM topology optimization. Second, utilizing the same geometric constraints in both the density-based topology optimization and the level set optimization enables to perform a more unbiased comparison between both methods. These different features are illustrated in a number of well-known benchmark problems for topology optimization. The work presented in this paper was performed in the framework of the Any-Shape 4.0 project supported by the Walloon Region (grant number 151066).